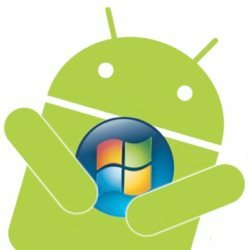 Ever wish you could run all your favorite Android apps on your Windows computer? Silicon Valley startup BlueStacks believes there's a big market interested in such a thing -- both consumer and enterprise -- and has come up with a virtualization solution that provides a foundation for Google's mobile operating system on top of Windows. BlueStacks has yet to share details on pricing and the availability of the final software, but a free beta is expected in June or July. The company is also expected to announce partnerships with OEMs to offer the software pre-loaded on their Windows systems, and is teaming up with Citrix to deliver its virtualization solution to enterprise customers. According to Rosen Sharma, president and CEO of BlueStacks, users won't necessarily have to toggle between operating systems in order to run Android applications. Android apps can simply launch like any other Windows program, or the whole system can switch from Windows to the Android OS. Although Android apps are built for touchscreens, BlueStacks will support mouse and keyboard input, in addition to touchscreens on Windows tablets and all-in-ones. BlueStacks uses Amazon's Android marketplace to distribute apps as Google restricts its Android Market to specific ARM-based devices. Going forward the company plans to enable apps built for other mobile OSes, like WebOS and Meego, to run on Windows machines, and bridge the gap the other way too allowing Windows apps to run on Android. BlueStacks today announced it has secured $7.6 million in a first round of funding from several well known venture capital firms and will be showing off its Android + Windows solution at Computex in Taipei, beginning on May 31.